Gender equality gets a lot of attention these days, and for good reason: it is not only an issue of fairness but also, for companies, a matter of attracting the best workers, at least half of whom are women. There is also considerable economic value at stake for companies and nations. A new study by the McKinsey Global Institute finds that the world economy could add trillions of dollars in growth during the next ten years if countries met best-in-region scores for improving women’s participation in the labor force. As top executives think about pressing forward with their own gender initiatives, they can start with four prescriptions. Get committed. The first might seem self-evident: change initiatives must be a strategic priority to have any chance of success. Yet gender equality was a top-ten strategic priority for only 28 percent of companies in 2010, when a third didn’t have it on the strategic agenda at all. The situation improved somewhat by 2015, but there’s still a long way to go—especially given the clear link between leaders’ role modeling and time allocation—and the success rate of transformations. Broaden your action. Our research shows that gender equality requires executives to intervene across a broad range of factors, setting in motion disparate resources and people for years at a time. The focus in these interventions must be to help women become better leaders—and to design conditions under which they can. Crucial aspects include sponsoring (and not just mentoring) women, neutralizing the effects of maternity leaves on career advancement and wage increases, and evolving the criteria companies use for promotions to include a diversity of leadership styles. 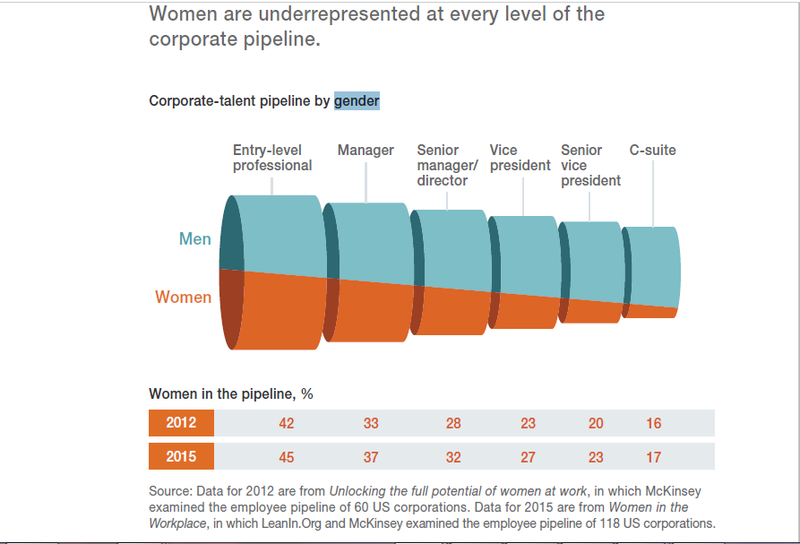 To learn how eBay embarked on a journey to bring more women into its top ranks, see “Realizing the power of talented women,” on mckinsey.com. Hold challenging conversations. Companies that make progress tend to hold a series of challenging conversations about gender issues among their executive teams. 3. Do we provide sponsors as well as role models? 4. Are we rooting out unconscious bias? Transformations are more likely to succeed when company leaders are active and involved.